Two Northwest favorites come together to create one fantastic dish! 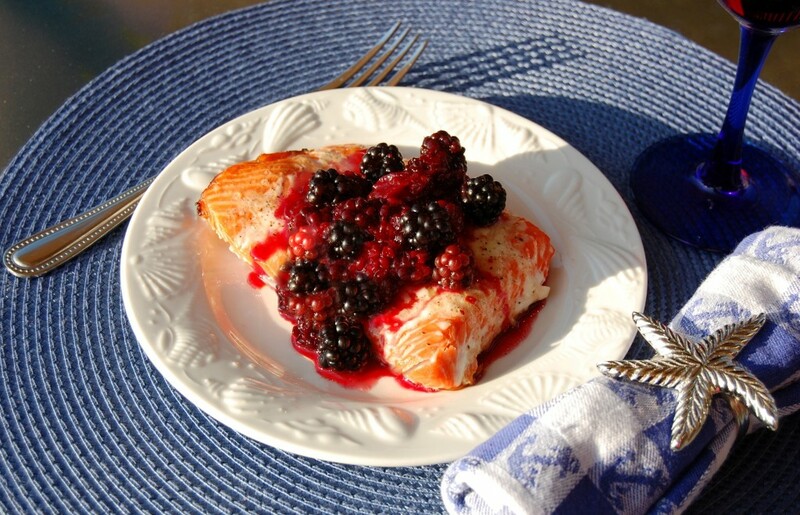 Our blackberry sauce can be served with any kind of broiled, grilled, baked or pan-fried fish. 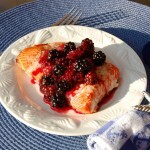 Wild Blackberry Sauce: In a medium saucepan, over medium, heat oil and sauté shallots until lightly brown. Stir in remaining ingredients, bring to a boil. Reduce heat and simmer about 12-15 minutes or until sauce is thick but still chunky. Salt and pepper to taste. Makes 2 cups. Preheat grill to medium. In a small pan, over low, heat butter, lemon juice, sugar and pepper flakes until butter has melted. Rinse fish and pat dry. Cut salmon into 6 portions. Place on oiled grill. Brush salmon fillets with butter mixture and season with salt and pepper.